Winter Storm Toby is starting to wind down – at least in the western suburbs. The snow is still falling – and adding to accumulations well over a foot in some places – in Philadelphia and South Jersey. The storm will continue to move out to the northeast through the night, but some places will still see another couple of inches. 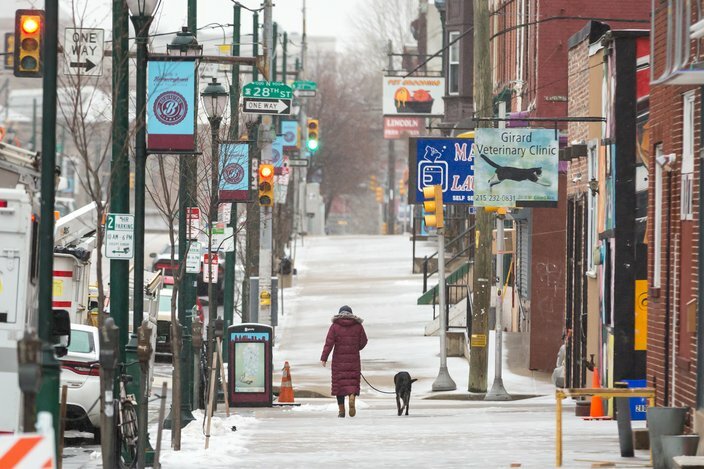 By the time it's all over, about 11 inches of heavy, wet snow were expected on the ground in Philadelphia, according to the National Weather Service. Downed trees and power lines – seen during previous nor'easters this month – had posed concern but the strong, gusty winds forecast for much of the region never quite developed. SEPTA was ready earlier in the day to deal with such problems. "It's definitely a concern," said spokesman Andrew Busch said. "We have crews placed throughout the system to try to respond to those situations, if they come up. Fortunately, we haven't had any trees down today. That's a good sign so far. Obviously, we still have a good portion of the storm to get through, if forecasts hold." The transit agency did see other problems due to the snow accumulations on area roads. Additional bus routes could get suspended throughout the day, particularly in hilly areas, Busch said. But the Broad Street and Market-Frankford subway lines will continue operating throughout the night. Road conditions continued to deteriorate all day. 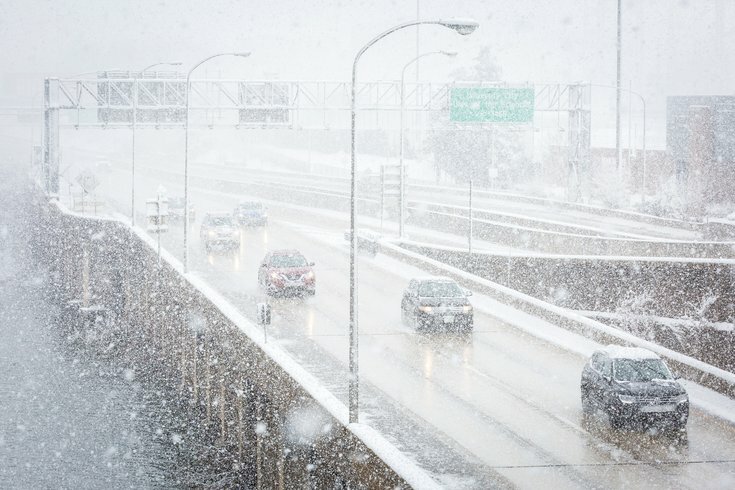 Earlier in the day, Pennsylvania officials urged motorists to avoid roadways, noting that the heaviest snow will fall through the afternoon into the evening. After pelting the city with freezing rain during the morning commute, the nor'easter began dropping snow on Philly in mid-morning. The rate of snowfall really picked up in the early afternoon, with the heavy snow piling up on driveways and sidewalks, and sticking to trees and power lines. It continued after dark. 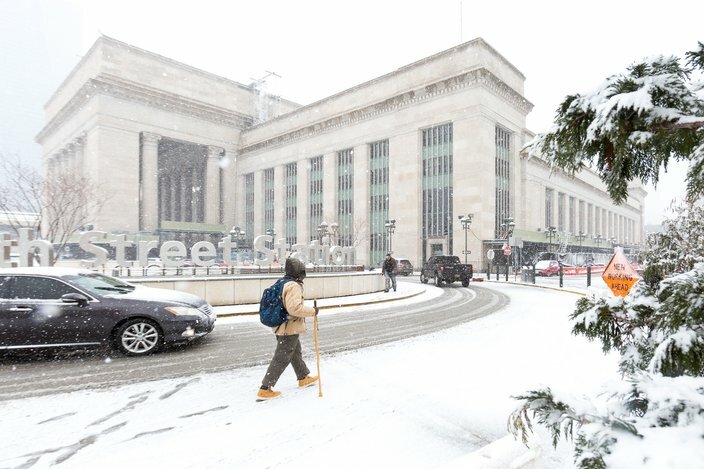 A pedestrian walks with a stick near 30th Street Station as snow began to lay on the roads during Winter Storm Toby late Wednesday morning, March, 21, 2018. On Wednesday morning, state officials – including Gov. Tom Wolf – urged caution. Wolf, who declared a statewide disaster emergency, pledged that PennDOT and utility crews would work hard to salt, plow and clear roadways. "We'll see that they're ready," he said. "We're going to respond as quickly as we can throughout Pennsylvania." As of 7:15 p.m., about 360 PECO customers were without power. In South Jersey, where coastal winds gusted near 35 mph, some 23,000 Atlantic City Electric customers were without power, and about 230 PSEG customers lacked power. A layer of sleet covers the sidewalks on the 2800 block of Girard Avenue early Wednesday morning, March, 21, 2018. A 25 mph speed restriction is in effect on the following Delaware River bridges: Ben Franklin, Walt Whitman, Betsy Ross and Commodore Barry. Traffic on the New Jersey Turnpike from the Delaware Memorial Bridge to the Pennsylvania Turnpike interchange is restricted to 50 mph due to roadway conditions. The Garden State Parkway, from Cape May to Irvington, has a 45 mph speed restriction. There also is a 45 mph speed limit restriction on the entire Pennsylvania Turnpike and Northeast Extension, I-95, I-76, I-476, Route 422, Route 309 and Route 63. There is a ban on empty straight CDL-weighted trucks, large combination vehicles, tractors hauling empty trailers, motorcycles and recreational vehicles on the Pennsylvania Turnpike and Northeast Extension. The vehicle ban is also in effect on I-95, I-76 and I-476. Restrictions will remain in place throughout the storm. 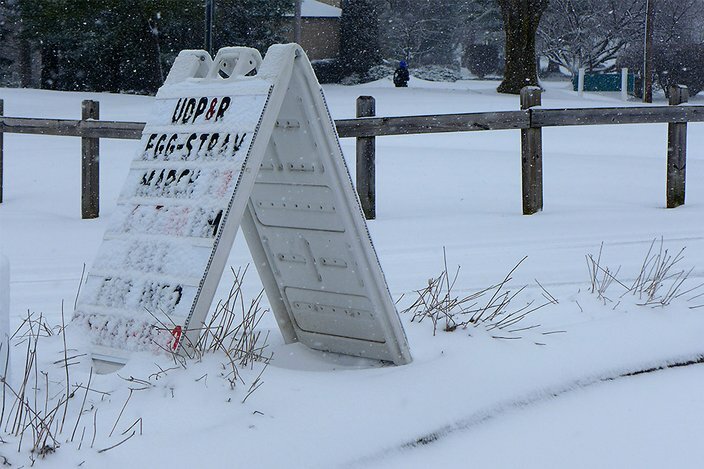 A snow-covered sign promotes a township parks and recreation Easter egg hunt scheduled for Friday night at Mondauk Common park, on Wednesday afternoon in Upper Dublin, Montgomery County. SEPTA has enacted its Severe Storm Service Plan, operating its Regional Rail trains on a Saturday schedule. The transit authority expects to cut back or suspend bus service on routes that are historically impacted by snow. Additional information on SEPTA can be found here. NJ Transit suspended its bus service at 3 p.m.
Amtrak is operating at modified service because of the weather. Many Acela and Northeast Regional trains between Washington and Boston were canceled. Full service will be restored when it is safe to do so, railroad officials said. More than 700 flights have been canceled at the Philadelphia International Airport. Schools, courts and municipal offices across the region have closed. And the city entered a snow emergency at 9 a.m., prohibiting motorists from parking along major thoroughfares.